The developers of contemporary digital location-based services, like all makers of maps, commit to a series of decisions about how to portray the world. The urban neighborhood is a particularly revealing level of geographic abstraction, in part because it assumes such varied forms for different observers, lacking official boundaries in many North American cities. Simple decisions about how to represent neighborhood boundaries in software have profound consequences for how the people using these services navigate, understand, and evaluate their world. Many popular geospatial software products treat urban neighborhoods as a lattice of non-overlapping polygons covering all space. This hyper-legible view of urban space has roots in Enlightenment political rationality, the Chicago School of urban sociology, and the real estate industry. Digitally defined neighborhoods become objects of social struggle through contested boundaries, contested names, and the social effects of neighborhood scale, or the way that certain services’ programmed delineations of neighborhood affect the way their products function. Popular local social network Nextdoor consists of an archipelago of self-organized, private ‘neighborhoods’ closed to outsiders, some confined to the size of individual condominium buildings in gentrifying neighborhoods. This downscaling of community to only the most immediate neighbors has contributed to tensions around racial profiling and economic inequality in areas where large proportions of residents use these services, particularly the San Francisco Bay Area and Seattle. A patchwork of fixed polygonal borders is one of many possible ways to portray neighborhoods in code, and reflects an instrumentalist understanding of urban space already under attack by mid-20th century social science. This paper is organized as follows. First, a genealogy of the dominant approach to urban neighborhood boundaries in location-based services and geoweb applications, that of enclosed polygonal areas. This is followed by a brief review of the ways geospatial software developers represent neighborhoods, categorized by a series of decisions about spatial data storage and display, and then a discussion of the ways that spatial data structures become enmeshed in broader social struggles around the fragmentation and commodification of urban life. This is followed by an extended case study of the local social network Nextdoor, considering some of the social and political implications of the choices its developers made in dividing urban space. The paper concludes with a consideration of alternatives to the fully legible digital spatial imaginary outlined in the preceding sections, both already existing and speculative. In his discussion of the gentrification of the South Brooklyn waterfront around the turn of the 21st century, sociologist David Madden refers to named urban neighborhoods as ‘spatial projects’ put forward by specific classes and interest groups; real estate developers pushing to rebrand formerly disinvested neighborhoods across cities in North America and Europe, urban politicians looking to attract tourists and businesses, and affluent homeowners and renters aiming to reshape their surroundings. 17 Madden refers to this kind of abstract governable space as ‘the Westphalian neighborhood imaginary.’ 18 Westphalian neighborhoods are clearly circumscribed and non-overlapping, like the checkerboard of sovereign European states that emerged from the ashes of the Thirty Years War in the 1648 Peace of Westphalia. Madden characterizes this way of seeing urban neighborhoods, which dominates contemporary social scientific literature around neighborhood effects and opportunity, as naturalistic, depoliticized, ahistorical, and functionalist. 19 The Westphalian neighborhood is an organic expression of social groups, with clear borders that remain relatively fixed over time, unlike Madden’s study area in Brooklyn, which over just a few decades cycled through a series of names, spatial divisions, and land uses. The prevailing attitude towards urban space as a neutral container in neighborhood discourse can be traced back to three main sources: the post-Enlightenment nation state, early 20th-century American social science, and the real estate profession. How do geospatial software developers choose to represent urban neighborhoods? 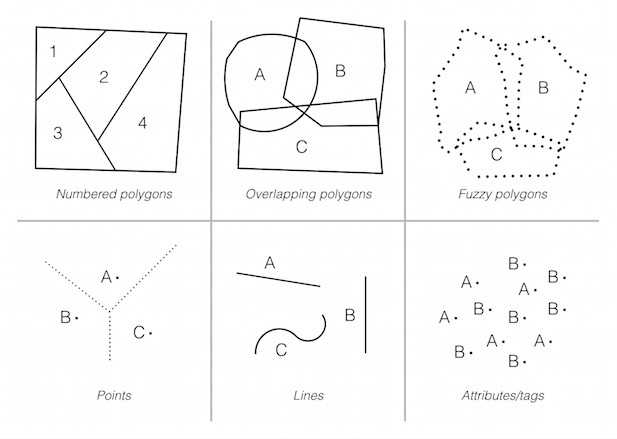 Many encode neighborhoods as discrete, named polygons, composed of linear boundaries enclosing homogenous areas, a version of the Westphalian spatial imaginary in software. In its purest form, these districts touch without overlapping, and cover the full territorial extent of the city. Figure 1 is a map of San Francisco created using the neighborhood boundary shape files from Zillow, a Seattle-based company that represents over 60% of the online real estate market, with over 70 million monthly unique users. 28 This image is a visualization of an underlying data structure that sorts new listings on the site into neighborhoods that prospective homebuyers can use to filter their searches. With the exception of Golden Gate Park, the Presidio (overseen by the National Park Service), and a few outlying docks, every parcel of land in the city is assigned to one and only one neighborhood. This total view of the city, with named, non-overlapping, polygonal neighborhood boundaries, is broadly representative of the way a variety of contemporary geospatial services represent urban space. Crossing the street, a prospective homebuyer moves from one neighborhood to another in an instant. This kind of spatial data structure is easy to implement, and aligns well with the way many external data are already formatted, from Census reports to geodemographic analyses of customer behavior. Geographer Helen Couclelis points to a fundamental problem in using software to represent space, namely the ‘discrepancy between the boundary-poor empirical world […] and the boundary-happy technology’ that we use to understand and manipulate it. 29 GIS software has historically relied on two different spatial data models, each with its own affordances and ontological assumptions. Raster models divide up the area being represented into a grid of equally-sized cells, and contain information about variables (rainfall, land cover, elevation) for each cell. They are well suited for working with remote sensing data and analyzing natural phenomena that are not territorially bounded, but since cell resolution affects the shape of the data, and information is stored at every point, they can be slow to render, and have trouble dealing with neat political boundaries. Vector models, on the other hand, represent the world using points, lines, and polygons, storing only objects of interest like roads, land parcels, and governmental units, allowing for faster analysis and visualization of spatial objects that don’t encompass an entire area, and features that retain their shape at any scale. Contemporary geoweb services primarily rely on vector models, which share the ontological characteristics Crutzen and Kotkamp describe as basic to object-oriented programming, in which ‘the sequence in the modeling process—first classification and then instantiation—renders some phenomena incomplete or not represented at all.’ 30 Seeing the city like a database has the potential to cut off debate about the diverse character of urban space, and represents a mostly unnoticed arrogation of authority over representing the world by private technology firms. 31 When digital neighborhoods change their borders or get added or deleted over time, it is typically through opaque interventions by developers or designated power users, not by government legislation or through open negotiation in the public sphere. •	Are the boundaries for each neighborhood mapped polygons, so that a user can easily see their extent in a plan view? •	Are the neighborhoods in each system discrete and non-overlapping, so that each point in space belongs to one neighborhood? •	Does the system of bounded neighborhoods fill all space within the city, with a neighborhood designation for every point? •	Is there a clear nested hierarchy grouping sub-neighborhood areas into neighborhoods or neighborhoods into broader regions of the city? •	Does each neighborhood have a name that attempts to either line up with conventional usage in the area or propose a new designation? * These companies are all headquartered in the San Francisco Bay Area or Seattle. ** Google Maps and Yelp display polygonal neighborhood boundaries in desktop applications only, not on mobile devices. Foursquare never displays neighborhood boundaries, but uses them on the backend to sort listings in search results. As a free and open source collaborative mapping project, OpenStreetMap allows both point and polygonal neighborhood locations. Most location-based services, especially those associated with tourism and real estate, like Zillow and Airbnb, fall on the more legible end of the spectrum, followed closely by local social network Nextdoor (see Section III). By standardizing neighborhood boundaries through software, services like Zillow make the city more legible to realtors and prospective homebuyers and sellers. This elective affinity between specific uses and data formats reveals the increased importance of subdividing and branding space for those who intend to profit from its sale or lease. A blog post by several senior Airbnb engineers makes it clear that cities themselves, not individual rental apartments and houses, are the company’s real product; ‘if Apple has the iPad and iPhone, we have New York and Paris.’ 33 Note that only Craigslist and Foursquare use free and open source project OpenStreetMap (OSM) for their base spatial data layer, while most of the real estate services use Google Maps, though they all use substantially different neighborhood boundaries. These services typically use a variety of government, realtor, commercial, and user data, in addition to a significant amount of discretion, to decide where to draw neighborhood boundary lines. 34 Airbnb, in particular employs a staff cartographer charged with determining the location of neighborhoods in popular cities, helping the site’s developers and users ‘understand a place without ever having been there.’ 35 Zillow is the only service to use a basemap besides Google or OSM, from their Seattle neighbor Microsoft’s Bing Maps unit. Bing Maps, like Apple Maps and Mapquest, primarily concerned with navigation from point A to point B, only represent neighborhoods as points, while Google Maps and OpenStreetMap, both projects aiming to impose order on geographic knowledge (and earn a profit, for Google), use polygons in some applications. Some digital platforms not only support existing spatial projects of externally created neighborhoods, but divide the world up into bespoke areal units for their own purposes. Popular local social network Nextdoor, founded in 2010 by serial entrepreneur Nirav Tolia (previously a cofounder of crowdsourced product review site Epinions in 1999, now owned by eBay, and currently defunct sports media site Fanbase.com in 2008), serves as a combination of online community bulletin board and neighborhood watch, with membership restricted to residents in particular physical locations. The company sends new users codes in the mail or verifies billing addresses to prove their residence, a literal geocoding of subjects that runs against the techno-libertarian tendency to anonymous, deterritorialized identity on much of the Web, aligning more closely with Facebook founder Mark Zuckerberg’s goal of having only one identity linked to a real name for every Internet user. 59 Posts are by default only visible in your own neighborhood, and can only be shared within a relatively small radius of adjacent ones, but sponsors and government agency partners like local police departments can send city-wide messages. 60 Public agencies are able to do this for free, since their participation is part of the value proposition to residents getting up-to-the-minute information about local safety and services. Nextdoor has secured over $210 million in venture capital funding from firms including Kleiner Perkins Caufield & Byers, Benchmark Capital, Google Ventures, and Bezos Expeditions (owned by Jeff Bezos, Amazon’s founder). In its most recent Series D equity funding round in 2015, Nextdoor was valued at over $1 billion, making it a “unicorn” in Silicon Valley jargon, in large part due to its ambition to scale quickly to cover every neighborhood in America and offer this audience to advertisers. By 2017, the company had sponsored posts from national brands including Lyft, AT&T, Care.com, and Ring home security, key to their long-range plans to reach profitability, along with local business advertising comparable to local search services like Yelp or Angie’s List and a “Real Estate” section generating additional revenue from referral links to local realtors’ websites. In a clue to their target demographic, after signing up to start a neighborhood, the first prompt Nextdoor gives users is to “tell your spouse about Nextdoor” to make sure they get important local updates. 61 As Benchmark Capital general partner Bill Gurley, who has funded Tolia’s companies since Epinions, puts it, Nextdoor is aiming to be a “substitution of Craigslist,” an idiosyncratic privately-held local classifieds website that has resisted most efforts to monetize their massive audience through corporate partnerships and advertising; he has also referred to the site as “Facebook for your neighborhood”. 62 Facebook and Google, for their part, have been steadily increasing their footprints in local search and communications; Facebook’s Recommendations feature allowing users to request and offer advice about local business, which launched in 2016, is almost identical to Nextdoor’s feature of the same name, and both compete with Yelp and Google Local’s aggregated business reviews. Unlike realtors, who look to both reflect and create ‘common sense’ neighborhood definitions, Nextdoor is most concerned with boundaries that create active communities, regardless of their fidelity to conventional definitions of place. 63 Users seeking to start new neighborhoods have twenty-one days to convince ten of their neighbors to join the site, like a digital reenactment of the 19th-century Homestead Acts requiring land claims in the Western United States to be improved to take title. Successfully launching a neighborhood is one of several ways for an ordinary user to become a ‘Lead,’ with greater powers to moderate discussion, adjust neighborhood boundaries, block membership, and promote other members to Lead, all on a strictly volunteer basis. 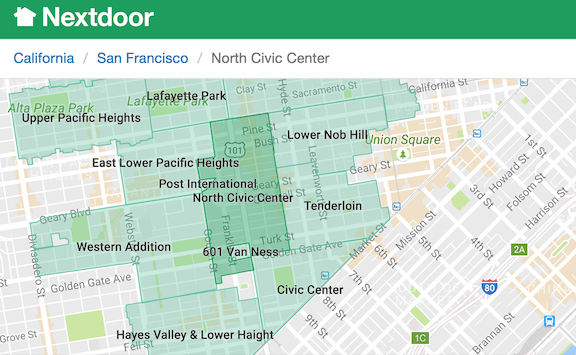 Nextdoor’s home city of San Francisco provides stark examples of the spatial fragmentation that ensues from these bottom-up structures, in which early adoption by wealthier residents creates fewer, smaller neighborhoods in high-rent districts. Within a few blocks of City Hall, there are two Nextdoor ‘neighborhoods,’ named ‘Post International’ and ‘601 Van Ness,’ that consist of solitary luxury condominium buildings in otherwise mixed-income areas, islands within the ‘North Civic Center’ neighborhood (see Figure 3). These elite enclaves lie within San Francisco’s Western Addition, historic heart of the city’s African-American community and the hardest hit by postwar urban renewal, which cleared the land now occupied by these buildings of housing considered blighted. Even half a century later, social disparities between old and new residents inform the spatial organization of digital neighborhoods on Nextdoor, insulating recent arrivals from their surroundings. Why is this digital cloistering of wealthy individuals in small areas an issue? Using platforms like Nextdoor, digitally-savvy residents have the potential to redirect law enforcement priorities toward preventing property crimes in rich neighborhoods. In a radio interview discussing the Seattle Police Department’s partnership with the site, Seattle Mayor Ed Murray noted his frustration that most complaints on Nextdoor are not from areas that have ‘significant crime problems, which tend to be our communities of color in the south part of the city.’ 68 Like many aspects of the contemporary personalized digital media ecosystem, Nextdoor posts are opaque en masse. They are difficult to study systematically due to both their geographic segregation of access rights and restrictive terms of service that allow the site to ban journalists and activists for relaying speech conducted within their private online forum. Murray’s interview was given in response to the concerns of journalist Erica Barnett, who was briefly banned from Nextdoor for reporting on locals’ comments in a digital town hall with Seattle police. 69 Users of Nextdoor, digitally filtered by their home address to see only the concerns of their nearest neighbors, would have no way of knowing this, in contrast to their experience of previous media regimes like city-wide newspapers or local broadcasters, which continue to lose advertising revenue to challengers like Craigslist, Google, and now Nextdoor. Evidence also suggests that the enthusiastic adoption of sites like Nextdoor could be reinforcing existing class and racial boundaries in increasingly divided cities, drawing lines between ‘us’ and ‘them’ and amplifying the voices of neighbors who want to use the site to profile people they consider outsiders, even those who may have lived in the area for generations. Filtering user interactions into smaller spatial units could be both an effect of how people perceive the class and racial makeup of their area, and an amplifier of existing prejudices. Sociologist Jackelyn Hwang’s interviews with residents of a gentrifying area in Philadelphia reveals a racial dimension to differing neighborhood spatial imaginaries, with white respondents referring to smaller spatial units with unconventional boundaries and names to exclude areas they perceived as high crime and lower status. 70 Minority residents, on the other hand, regardless of socioeconomic status or tenure in the area, defined their neighborhood as a larger area (‘South Philly’) with a single name, relatively consistent boundaries, and a rich African-American cultural history. Since economist Thomas Schelling proposed a crude agent-based model of urban segregation in 1971, in which individual agents move when the racial composition of their neighborhood approaches a given ‘tipping point,’ 71 scholars have been using these models to explore urban social dynamics. 72 Studies of agent-based models based on Schelling’s have found that giving each agent a wider radius of comparison (or ‘vision’) leads to stable mixed neighborhoods, even given a fairly substantial preference for living among members of the same group. 73 This is a troubling finding to consider when applied to Nextdoor’s self-selecting and segregating small networks. Beyond the problems outlined above relating to the commodification, fragmentation, and segregation of urban space, on a fundamental level the Westphalian spatial imaginary fails to align with the manifold personal experiences and interconnections that structure daily life in a city. Are there alternatives to the fully legible representations of space outlined above? How else can we base digital representations of urban neighborhoods? Some of the digital platforms included in Table 1 abandon various aspects of the conventional Westphalian neighborhood imaginary exemplified by real estate websites like Zillow, to various effects, while academics, artists, and cartographers have also experimented with other approaches. 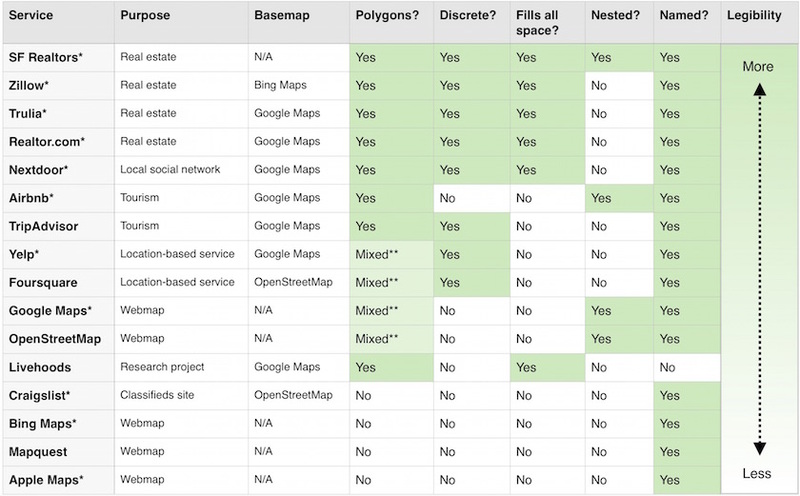 Table 2 illustrates a range of different approaches besides treating neighborhoods as discrete, non-overlapping named polygons that fill all space. Geospatial software could eliminate the practice of assigning vernacular names to neighborhoods, but keep the concept of discrete areas of contiguous experience, designated by numbers instead. The Livehoods project at Carnegie Mellon uses the locations of Tweets and Foursquare check-ins to create de facto neighborhoods of lived experience, at least among heavy users of these social media platforms, by mapping areas where the same users tend to spend their time. 87 These areas are notably numbered, like Parisian arrondissements, but for a Big Data-era rationality, determining neighborhood boundaries inductively from many small observations of similarity, instead of imposing spatial order on a Cartesian territorial from above. Despite this vastly different epistemological basis, if Livehoods’ numbered areas gained wider recognition among residents, they might also develop identities as vivid as Paris’ numbered districts, which are often used as a short-hand reference for the different kinds of people who live there (bourgeois intellectuals in the 6th, jetsetters in the 16th, hipsters in the 11th, etc.). Services like Yelp, Airbnb, and Google Maps employ a softer version of polygonal neighborhoods than the Westphalian spatial imaginary outlined above, in which multiple named neighborhoods can overlap and share space. Unlike real estate websites or Nextdoor, territorial exclusivity is less important in setting pricing or restricting access, and developers value complete, intuitive search results over a tidy ontology. If a user looking for a given restaurant, attraction, or place to stay might type in more than one neighborhood name, these services are content to meet them half-way and associate multiple names with given coordinates. An even more permissive approach accepts that neighborhoods exist as meaningful objects of analysis, but grants them indeterminate or shifting boundaries based on residents’ individual mental maps, following MIT urban planner Kevin Lynch’s method and goals in his research leading up to 1960’s The Image of the City. 88 In the terms of science studies, the concept of the neighborhood becomes a ‘boundary object’ (in this case, both literally and figuratively), providing a stable shared understanding across users and functions, without full agreement on its extent or ontological status. 89 A variety of academics, journalists, and programmers have experimented with this, methodology, usually relying on surveys or letting people draw their own boundaries on maps. A recent online project called Bostonography, created by Andy Woodruff and Tim Wallace, aggregates online responses tracing out neighborhood borders, bringing a potentially much larger group of people to bear on similar questions through digitally mediated participation. 90 This approach avoids some of the problems with Westphalian boundaries, but the resulting maps are only as representative of the broader society as their contributors. Examples of neighborhoods that emanate from a point include those named after particular marketplaces, transit stations, or intersections, like Covent Garden or King’s Cross in London, or San Francisco’s Haight-Ashbury. In theory, any neighborhood scheme composed of points could be ‘translated’ into a map showing polygonal neighborhoods by assigning all intervening areas to the nearest point, but in practice services that rely on point-based neighborhoods usually omit this step of spatial enclosure. OpenStreetMap (OSM) allows contributors to add points representing neighborhood nodes in the Lynchian sense (even referring to them as ‘nodes’ in its internal ontology). OSM only displays these nodes’ names at large scales, not in zoomed out city views like in Google Maps. In keeping with the messy open-source ethos of the project, however, contributors can also designate polygonal neighborhoods, more commonly in cities with defined administrative boundaries like Paris. 93 There is little consistency from place to place, reflecting the interests and experiences of individual contributors to the free, open-source mapping project. In Boston, the North End is a node, but the South End is a polygon, based on city inspection district data and exactly replicating the neighborhood’s boundaries in Google Maps. This is almost exactly the opposite of what Lynch’s study and the Bostonography project report: a clear polygonal shape for the North End, surrounded by shoreline and the old Central Freeway, and murky boundaries for the South End. Neighborhoods defined only by lines, not enclosed into polygonal areas, may sound absurd given the power of existing spatial and technological convention, but there are some theoretical precedents for thinking this way. Many conventional neighborhoods are either named after or otherwise defined by specific linear stretches of urban thoroughfares; the Bowery in New York, the Embarcadero or the Fillmore in San Francisco. Kevin Lynch calls these prominent structuring elements of urban space ‘paths.’ 94 Other neighborhoods are defined by lines as edges. This is particularly prominent in real estate neighborhoods like New York’s SoHo (‘South of Houston Street’) and TriBeCa (‘Triangle Below Canal Street’) or San Francisco’s SoMa (‘South of Market Street’). As with points, any scheme assigning locations to the nearest neighborhood line would generate a polygonal equivalent, whether or not it was ever rendered. One approach would be to exclude urban neighborhoods entirely from geospatial software as irrelevant abstractions. In an age of GPS-enabled devices allowing coordinate locations to be fixed within a few meters, the need for intermediate spatial entities may be less urgent than in the days when businesses and city governments first standardized street addresses and neighborhood names. 96 If neighborhoods are an intermediate spatial concept that allow people to understand their surroundings through shorthand, do we still need them in an age where we can instantly fix our position and proximity to whatever we desire, whether a romantic partner, cocktail bar, or new luxury condominium? Did neighborhoods ever really mean much to residents in their daily lives, or was the reification of neighborhood just another artifact of post-Chicago School sociology and state or capitalist projects of legibility? It may be that all of these efforts to fix a particular ‘right’ way of ordering urban space into discrete neighborhoods miss the point. In an era where borders and walls are increasingly creeping back into political discourse and everyday life, perhaps it would be worthwhile to reexamine the borderings inherent to territorial units of community, and to assess what work they do, and which opportunities they close off. Even in the mid-20th century prime of positivist urbanism, there were dissenting voices, people who saw the discrete urban neighborhood as merely a convenient shorthand for social scientists and city planners, rather than a reflection of lived reality. British city planner Ruth Glass, best known today as the coiner of the term ‘gentrification,’ asserted in 1945 that ‘self-contained neighborhoods do not exist,’ since the boundaries of neighborhood life vary greatly for different people and activities. 98 Glass illustrated her point with a series of maps showing the diversity of where people shopped and which clubs they belonged to in the Bethnal Green area of East London, for example, displaying a patchwork of interpenetrating areas of influence that differ markedly for different family members and activities (food shopping, working outside the home, school attendance, club membership, etc. ), belying the tidy functional districts of Le Corbusier and other male Modernist planners. 99 While Glass was right to point out the ways that urban life is too complex to fit into neat boundaries, the fixed urban neighborhood is a tool far better suited to the purposes of governing and marketing space. So for the most part we live in an urban world of neatly bounded neighborhoods, districts, wards, homeowners associations, and real estate names: the Westphalian neighborhood imaginary, in Madden’s terms, which is only reinforced by its prominence in geospatial software, especially services dedicated to tourism and real estate, as seen in Table 1. Although many maps and location-based services use neighborhood names and boundaries to orient their users or brand urban space, as discussed above, Nextdoor integrates the bounded urban neighborhood as a primary element of its user experience and strategic plan. Nextdoor treats residential neighborhoods in the same way that Facebook does connections between people; as a medium through which information flows, generating increasing impressions and engagement on advertisers’ content over time. Social networks and neighborhoods existed long before they could be leveraged for digital communications platforms; what Facebook and Nextdoor offer is an operationalized or topological understanding of messy and contingent human experiences, one that is machine-readable and easily parsed by algorithms seeking to target advertising and encourage some behaviors over others. Nextdoor can be used to report street harassment or aid neighbors in a natural disaster, just like Facebook can be a powerful communication platform for activists and artists, but both services entice users with free accounts to generate and monetize massive audiences, with pernicious and opaque effects. Nextdoor’s focus on crime and integration of real estate listings bring together some of the most powerful tendencies of the “weapons of math destruction” Cathy O’Neill identifies as constraining democratic societies in the age of Big Data. 100 As Nextdoor and similar location-based services continue their rapid growth, corporations and governments have been increasingly using residential location to help determine not only the ads you see but the likelihood you may be approved for a mortgage or arrested, the interest on your loan or the length of your sentence. 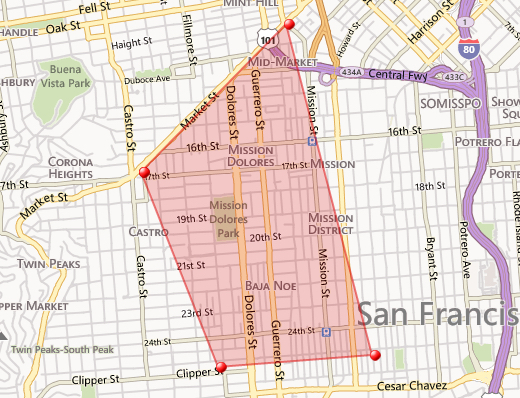 Given the long history of racial and class-based spatial segregation in American cities, the regressive effects of both geodemographic targeting and surveillance capitalism may reinforce each other as neighborhoods themselves become weaponized, and the more or less arbitrary polygons drawn on Nextdoor’s map by digital homesteaders delimit our social worlds. Annechino, Rachelle, and Yo-Shang Cheng. “Visualizing Mental Maps of San Francisco” (MA thesis, School of Information, UC Berkeley, 2011). Barreneche, Carlos. “The order of places: Code, ontology and visibility in locative media.” Computational Culture 2 (2012): 26. Bowker, Geoffrey C., and Susan Leigh Star. Sorting Things Out: Classification and its Consequences. Cambridge: MIT Press, 2000. Brenner, Neil. New State Spaces: Urban Governance and the Rescaling of Statehood. Oxford: Oxford University Press, 2004. Carbone, June, and Naomi Cahn. Marriage markets: How inequality is remaking the American family. Oxford: Oxford University Press, 2014. Charkov, Maxim, Riley Newman, and Jan Overgoor. “Location Relevance… aka knowing where you want to go in places we’ve never been.” Airbnb Nerds Blog. May 1, 2013. Chaskin, Robert J. “Perspectives on Neighborhood and Community: a Review of the Literature.” The Social Service Review (1997): 521-547. Chisholm, Matt and Ross Cohen. “The Neighborhood Project.” http://hood.theory.org/ Accessed September 27, 2016. Clift, Steven. “Public versus Private, Small versus Large – If NextDoor really was next door.” E-democracy.org. Aug 1, 2012. Couclelis, Helen. “Towards an Operational Typology of Geographic Entities with Ill-defined Boundaries.” in Burroughs, Peter and Andrew Frank, eds. Geographic Objects with Indeterminate Boundaries. London: Taylor & Francis, 1996. Crampton, Jeremy. “GIS and Geographic Governance: Reconstructing the Choropleth Map.” Cartographica 39, no. 1 (2004): 41-53. Cranshaw, Justin, Raz Schwartz, Jason I. Hong, and Norman Sadeh. “The Livehoods Project: Utilizing Social Media to Understand the Dynamics of a City.” International AAAI Conference on Weblogs and Social Media. 2012. Crutzen, Cecile and Erna Kotkamp. “Object Orientation.” in Matthew Fuller, ed. Software studies: A lexicon. Cambridge: MIT Press, 2008. Dalton, Craig M., and Jim Thatcher. “Inflated granularity: Spatial “Big Data” and geodemographics.” Big Data & Society 2, no. 2 (2015): 2053951715601144. Dangerfield, Andy. “Historic London Districts ‘Rebranded’ Midtown.” BBC News, September 17, 2010. Davis, Mike. City of Quartz: Excavating the Future in Los Angeles. Verso Books, 1990. Delevett, Peter. “Website Helps Neighbors Connect.” Los Angeles Times, November 7, 2011.
de Souza e Silva, Adriana. “Location-aware mobile technologies: Historical, social and spatial approaches.” Mobile Media & Communication 1, no. 1 (2013): 116-121. Dodge, Martin, Rob Kitchin, and Matthew Zook. “How does software make space? Exploring some geographical dimensions of pervasive computing and software studies.” Environment and Planning A 41, no. 6 (2009): 1283-1393. Feeney, Caroline. “Zillow Snags More Internet Market Share than Ever.” Inman. May 19, 2016. Ford, Heather, and Mark Graham. 2016. “Provenance, Power, and Place: Linked Data and Opaque Digital Geographies,” Environment and Planning D 34, no. 6 (2016): 957-970. Frith, Jordan. Smartphones as Locative Media. John Wiley & Sons, 2015. Gans, Herbert J. The Urban Villagers: Group and Class in the Life of Italian-Americans. New York: Free Press of Glencoe, 1962. Glass, Ruth. “Social Aspects of Town Planning.” The Architectural Review. March, 1945. Gottlieb, Dylan. “Dirty, Authentic… Delicious: Yelp, Mexican Restaurants, and the Appetites of Philadelphia’s New Middle Class.” Gastronomica 15, no. 2 (2015): 39-48. Graham, Mark, De Sabbata, Stefano, and Zook, Matthew. (2015) ‘Towards a Study of Information Geographies: (Im)mutable Augmentations and a Mapping of the Geographies of Information’, Geo, 2: 88–105. Graziani, Terra. “North Oakland Gang Injunction.” Scales of Gentrification, December 15, 2013. Harper’s. “Readings: If Looks Could Kill.” Harper’s Magazine, January 2016. Harshaw, Pendarvis. “Nextdoor, the Social Network for Neighbors, is Becoming a Home for Racial Profiling.” Fusion, March 24, 2015. Harvey, David. Paris, Capital of Modernity. Psychology Press, 2003. Harvey, Francis, and Nick Chrisman. “Boundary objects and the social construction of GIS technology.” Environment and Planning A 30, no. 9 (1998): 1683-1694. Harwood, Graham, and Matsuko Yokokoji. “Palinopsia.” Rhizome, January 8, 2015. Haughney, Christine. “‘SoBro’ and ‘ProCro’ NoJoke to Assemblyman.” New York Times, April 19, 2011. Hunter, Albert Dale. Symbolic Communities: The Persistence and Change of Chicago’s Local Communities. Chicago: University of Chicago, 1974. Hutcheson Jr., John D. “Research Report: Citizen Representation in Neighborhood Planning.” Journal of the American Planning Association 50, no. 2 (1984): 183-193. Hwang, Jackelyn. “The Social Construction of a Gentrifying Neighborhood: Reifying and Redefining Identity and Boundaries in Inequality.” Urban Affairs ReviewCrabgrass Frontier: The Suburbanization of the United States. Oxford: Oxford University Press, 1985. Jacobs, Jane. The Death and Life of Great American Cities. New York: Vintage, 1961. Kitchin, Rob, and Martin Dodge. “Code and the Transduction of Space.” Annals of the Association of American Geographers 95, no. 1 (2005): 162-180. Kitchin, Rob, Tracey Lauriault, and Matthew Wilson. (eds.) Understanding Spatial Media. London: Sage, 2017. Laurie, Alexander and Jaggi, Narendra “Role of ‘Vision’ in Neighborhood Racial Segregation.” Urban Studies 40 (2003): 2687–704. Lefebvre, Henri. The Urban Revolution. trans. Robert Bononno. Minneapolis: University of Minnesota Press, 2003 (1970). Lee, Jessica. “Nextdoor Flap Has Seattle Scrutinizing How it Handles Social Media.” The Seattle Times. March 14, 2016. Leszczynski, Agnieszka. “Situating the Geoweb in Political Economy.” Progress in Human Geography 36.1 (2012): 72-89. Leszczynski, Agnieszka, and Matthew W. Wilson. “Guest Editorial: Theorizing the Geoweb.” GeoJournal 78, no. 6 (2013): 915. Levin, Sam. “Racial Profiling via Nextdoor.com” East Bay Express, October 7, 2015. Logan, John R., and Harvey Molotch. Urban Fortunes: The Political Economy of Place. University of California Press: Berkeley, 2007. Lynch, Kevin. The Image of the City. MIT Press: Cambridge, 1960. Mack, Heather. “‘La Lengua’ Name Spurs New Merchant Group.” Mission Local, January 13, 2014. Madden, David J. “Neighborhood as Spatial Project: Making the Urban Order on the Downtown Brooklyn Waterfront.” International Journal of Urban and Regional Research 38.2 (2014): 471-497. Manovich, Lev. “The Poetics of Augmented Space.” Visual Communication 5, no. 2 (2006): 219-240. Martin, Scott. “Nextdoor Comes Knocking with Neighborhood Network.” USA Today, October 27, 2011. Masden, Christina A., Catherine Grevet, Rebecca E. Grinter, Eric Gilbert, and W. Keith Edwards. “Tensions in Scaling-up Community Social Media: A Multi-Neighborhood Study of Nextdoor.” Proceedings of the SIGCHI Conference on Human Factors in Computing Systems. ACM, 2014. Massey, Doreen. “A Global Sense of Place.” Marxism Today. June 1991: 24-29. Medina, Jennifer. “Website Meant to Connect Neighbors Hears Complaints of Racial Profiling.” The New York Times, May 18, 2016. Medway, Dominic, and Gary Warnaby. “What’s in a Name? Place Branding and Toponymic Commodification.” Environment and Planning A 46, no. 1 (2014): 153-167. Molotch, Harvey. ”The City as a Growth Machine: Toward a Political Economy of Place.” The American Journal of Sociology, Vol. 82, No. 2 (Sep., 1976), pp. 309–332. Monmonier, Mark. Bushmanders and Bullwinkles: How Politicians Manipulate Electronic Maps and Census Data to Win Elections. Chicago: University of Chicago Press, 2001. O’Donovan, Caroline. “Nextdoor Goes Dutch.” BuzzFeed News, February 16, 2016. O’Neil, Cathy. Weapons of Math Destruction: How Big Data Increases Inequality and Threatens Democracy. New York: Broadway Books, 2017. Openshaw, Stan. The Modifiable Areal Unit Problem. Norwich: Geo Books, 1983. Osman, Suleiman. The Invention of Brownstone Brooklyn: Gentrification and the Search for Authenticity in Postwar New York. Oxford: Oxford University Press, 2011. O’Sullivan, David. “Changing Neighborhoods—Neighborhoods Changing: A Framework for Spatially Explicit Agent-Based Models of Social Systems.” Sociological Methods & Research 37.4 (2009): 498-530. Pariser, Eli. The Filter Bubble: How the New Personalized Web is Changing What We Read and How We Think. New York: Penguin, 2011. Perry, Clarence A. 1929. “The Neighborhood Unit.” In Regional Survey of New York and Its Environs, vol. 7. New York: Committee on Regional Plan of New York and Its Environs. Rao, Leena. “Here’s Where Neighborhood Social Network Nextdoor Is Moving Next.” Fortune, September 13, 2016. Rosdail, Jennifer. “The Quad – A Newly Defined Meta Hood.” March 7, 2014. Rose-Redwood, Reuben. “Indexing the great ledger of the community: urban house numbering, city directories, and the production of spatial legibility.” Journal of Historical Geography 34, no. 2 (2008): 286-310. Rose-Redwood, Reuben, Derek Alderman, and Maoz Azaryahu. “Geographies of toponymic inscription: new directions in critical place-name studies.” Progress in Human Geography 34, no. 4 (2010): 453-470. Sampson, Robert, Jeffrey Morenoff, and Thomas Gannon-Rowley. “Assessing ‘Neighborhood Effects’: Social Processes and New Directions in Research” Annual Review of Sociology 28 (2002): 443–478. Schelling, Thomas C. “Dynamic Models of Segregation.” Journal of Mathematical Sociology 1, no. 2 (1971): 143-186. Shahani, Aarti. “Social Network Nextdoor Moves to Block Racial Profiling Online.” NPR All Tech Considered, August 23, 2016. Shoff, Harrison. 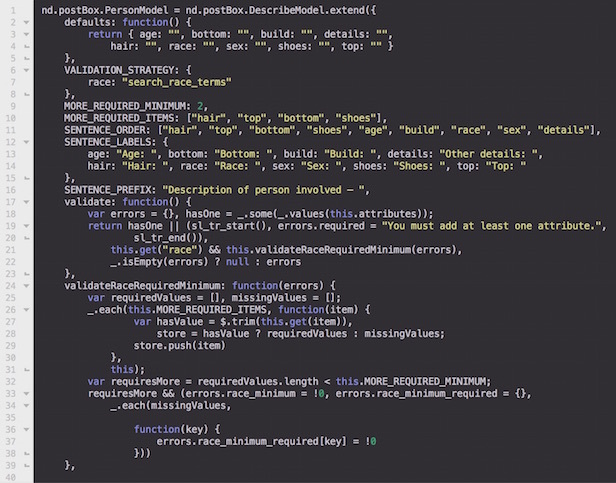 “Mapping the World.” Airbnb Code Blog. January 7, 2015. Singh, Raj R. “Sketching the City: a GIS-based Approach.” Environment and Planning B 26, no. 3 (1999): 455-468. Smith, Barry, and David M. Mark. “Do Mountains Exist? Towards an Ontology of Landforms.” Environment and Planning B 30, no. 3 (2003): 411-427. Smith, Barry, and Achille C. Varzi. “Fiat and Bona Fide Boundaries.” Philosophical and Phenomenological Research (2000): 401-420. Smith, Victoria. “Shape-shifting NYC neighborhoods: Why search sites differ on the boundaries, and how it affects your bottom line.” Brick Underground. September 15, 2016. Star, Susan Leigh, and James R. Griesemer. “Institutional ecology, ‘translations,’ and boundary objects: Amateurs and professionals in Berkeley’s Museum of Vertebrate Zoology, 1907-39.” Social Studies of Science 19, no. 3 (1989): 387-420. Stephens, Monica. “Gender and the GeoWeb: divisions in the production of user-generated cartographic information.” GeoJournal 78, no. 6 (2013): 981-996. Stoica, Victor Ionut, and Andreas Flache. “From Schelling to Schools: A Comparison of a Model of Residential Segregation with a Model of School Segregation.” Journal of Artificial Societies and Social Simulation 17, no. 1 (2014): 5. Svensson, Patrik, and Erica Robles-Anderson. “‘One Damn Slide After Another’: PowerPoint at every Occasion for Speech.” Computational Culture 5 (2016). Trufelman, Avery. “The SoHo Effect.” 99% Invisible, March 15, 2016. Turnquist, Kristi. “‘Portlandia’ Season 3: The rats will play.” The Oregonian, February 23, 2013.
van Dijck, José. “‘You have one identity’: Performing the Self on Facebook and LinkedIn.” Media, Culture & Society 35, no. 2 (2013): 199-215. Waddell, Kaveh. “The Police Officer ‘Nextdoor.’” The Atlantic, May 4, 2016. Wildermuth, John. “S.F. 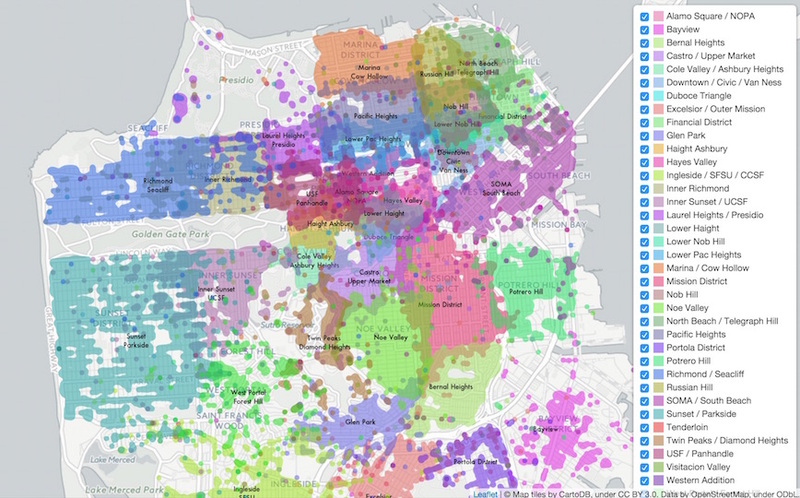 Neighborhoods Change Names to Map Out New Identity.” The San Francisco Chronicle, March 23, 2014. Wirth, Louis. “Human Ecology.” American Journal of Sociology Vol. 50, No. 6 (May, 1945):483-488. Woodruff, Andy. “Crowdsourced Neighborhood Boundaries, Part One: Consensus.” Bostonography. July 2, 2012. Yeh, Chris. “CS183C Session 12: Nirav Tolia, Nextdoor.” Blitzscaling: Class Notes and Essays. October 29, 2015. Zuboff, Shoshana. “Big other: surveillance capitalism and the prospects of an information civilization.” Journal of Information Technology 30, no. 1 (2015): 75-89. Zukin, Sharon. Loft Living: Culture and Capital in Urban Change. Rutgers University Press, 1989. Zukin, Sharon, Scarlett Lindeman, and Laurie Hurson. “The omnivore’s neighborhood? Online restaurant reviews, race, and gentrification.” Journal of Consumer Culture (2015): 1469540515611203.